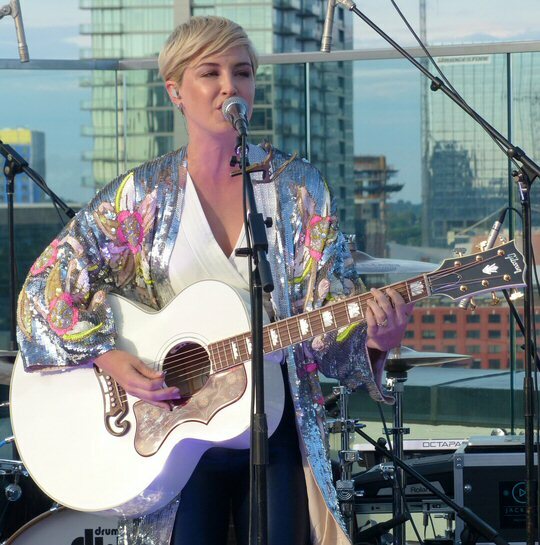 Broadcast Music, Inc. (BMI) launched its “Rooftop On The Row” summer concert series on May 23, 2017 in Nashville with performances from Maggie Rose and LOCASH. The private, VIP-only event was well attended as industry insiders turned out in force for a night of great music and enticing incentives provided by the evening’s sponsors including Yeti Coolers, Texas Roadhouse, George Dickel Whisky and Samuel Adams. 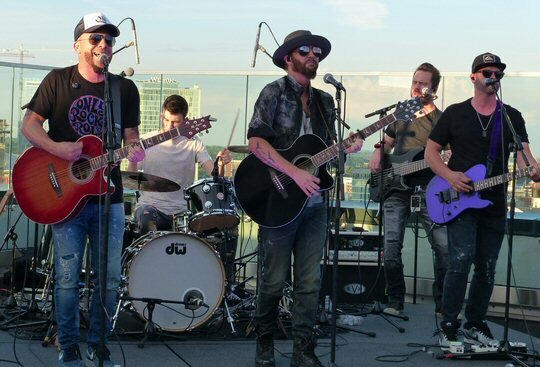 LOCASH – the boys are back in town in Nashville. The weather was perfect as blue skies mixed with clouds set a backdrop for the party. 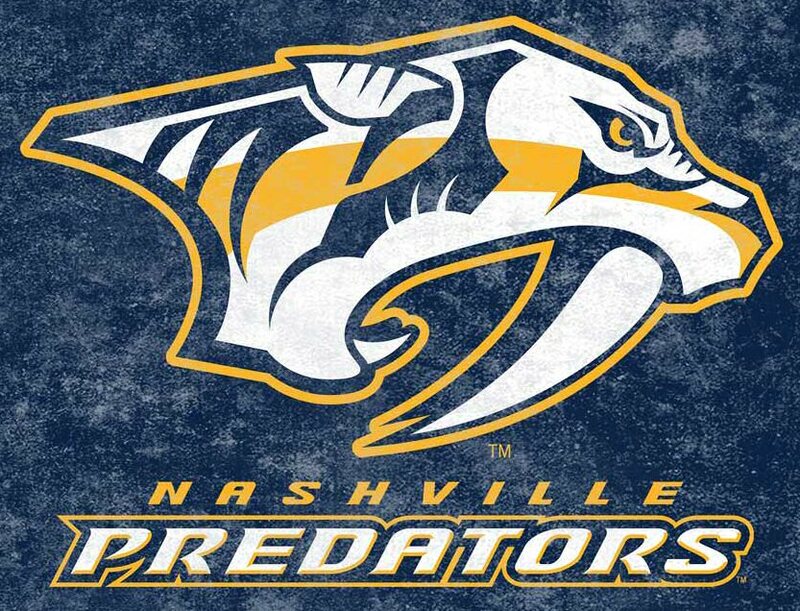 More importantly, the crane riddled Nashville skyline provided an interesting metaphor for the night’s entertainment. For as Music City continues to rise and grow beyond belief in 2017, BMI remains one of three United States performing rights organizations that collects license fees on behalf of songwriters, composers, and music publishers and distributes them as royalties to those members whose works have been performed. In this way, BMI keeps the music business sustained and growing even in so-called troubled times for the industry. LOCASH were heroes in Nashville topping all the lists of favorite local act before soaring to new heights when their anthem “I Love This Life” hit the Top 5 in late 2015. The second single from their EP “I Know Somebody” reached number one on the Billboard charts in October 2016. The duo is flying high and their anticipated performance on the BMI rooftop served to underscore their success. The current single “Ring on Every Finger” from their album The Fighters was played at the event and it looks like the hit machine is still functioning at a high rate of efficiency with this latest effort. BMI’s Director David Preston presented the LOCASH cowboys their first-ever “Million-Air” certificate for their song “You Gonna Fly” that was covered by Keith Urban. Preston Brust and Chris Lucas were both appreciative before they proceeded to play the tune for a boisterous crowd on Music Row. Maggie Rose was delightful and charming with not a thorn in sight. The festivities kicked off with a fine set from the bubbly and energetic Maggie Rose who has been a BMI artist for over a decade now. The diminutive blonde locked singer was feisty as she belted out several tracks from her quality new EP, Dreams>Dollars. Dressed in a long flowing sequined jacket and matching silver boots Rose displayed the talent that landed her an opening slot on Tim and Faith’s upcoming tour. Her sensual hot new track “Body on Fire” revealed just why she is winning a hoard of new fans every time she picks up a guitar and starts to sing. 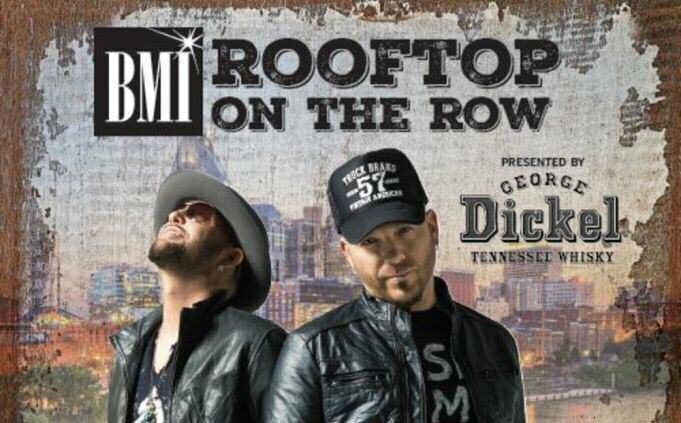 BMI will host five “Rooftop On The Row” events throughout the summer showcasing a mix of up-and-comers and established veterans. William Michael Morgan, Fairground Saints, Emily Earle, Aaron Lewis, and Walker McGuire are among the artists tapped to perform during the season with more to be announced. 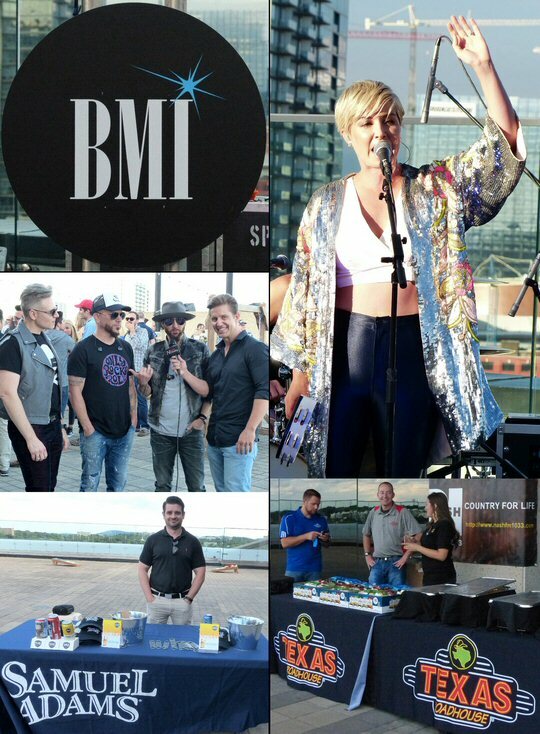 Scenes and sponsors at BMI’s kickoff “Rooftop On The Row” concert series.